Type your Airnet Cargo tracking number below, get live delivery information with our express tracking system. 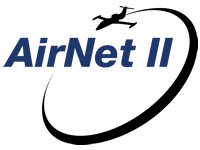 A renowned aviation leader in scheduled and on-demand cargo charter services, avionic installations and aircraft maintenance, AirNet II operates as a Federal Aviation Administration (FAA) 135 air carrier and 145 repair station. AirNet II has a fleet of Beechcraft Barons and Bombardier Learjets with team members based primarily in Columbus Ohio and St. Louis Missouri. The company offers specialized services for transporting radiopharmaceuticals/nuclear medicine. It provides a full spectrum of aircraft maintenance on all major manufacturers and is a FAR Part 145 Certified Repair Station (#BSYR610C) with Class Ratings that allow it to offer avionics and airframe and services. If you have problem with our Airnet Cargo Tracking system, submit your problem here, we will help you as soon as possible. Declare: We can NOT contact carrier or others on your behalf, we can only help you track your package with your AirNet II tracking number on official tracking system.